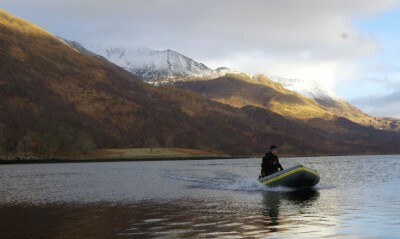 Alongside my “main” boat I’ve also been the proud owner of an Avon R310 inflatable boat, or SIB, for over 20 years. Not used as much nowadays, it still gets out several times a year and has provided some good memories together with access to fishing I wouldn’t otherwise have got. It’s also in pretty good nick – not bad for a boat that many anglers regard as a flimsy substitute for the real thing. So where’s it seen service? Well, mainly on quiet evenings off Dunbar, offering a couple of hours relaxation close inshore when I couldn’t be bothered with the hassle of a big boat launch. However it’s also seen service launching in quiet coves near Aberdeen; off Tarbet Ness in the Moray Firth; Point of Stoer near Lochinver; west coast sea lochs; and around the Mull of Galloway. On one occasion it spent a week touring south and west Ireland, sitting quite nicely in the car boot for the ferry crossing. 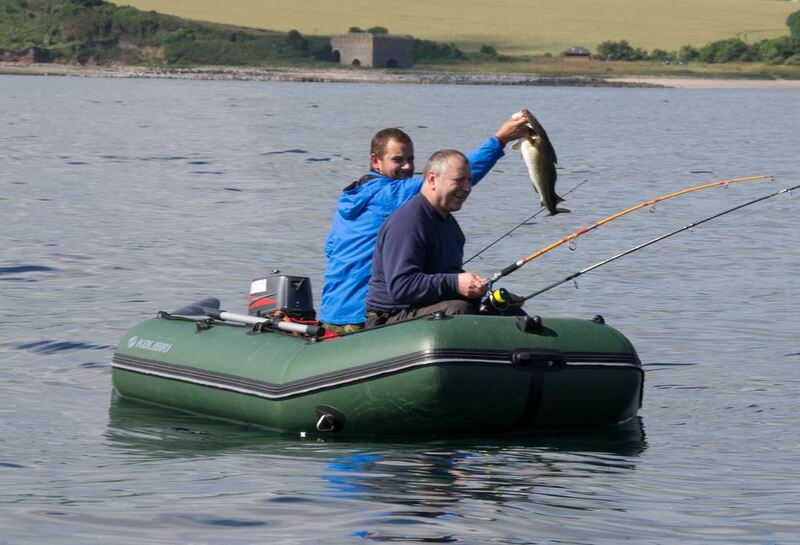 I’m talking here about Soft Inflatable Boats (SIBs) and not the Rigid Inflatables (RIBs) used by most divers. 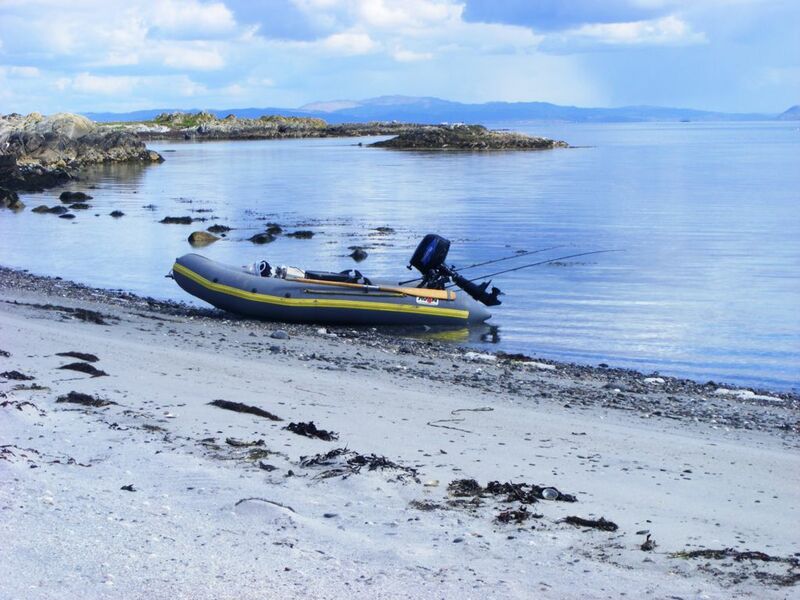 For fishing purposes a SIB really needs to have a decent floor – preferably aluminium or plywood – rather than simply be a donut shaped yacht tender. The Avon is constructed from hypalon which has proved excellent and long lived, even when “cared” for by me. Other materials are available but I’ve no personal experience of them. The biggest pro is undoubtedly its portability, and this applies in two ways. First, it can be packed away in a car quite easily (especially with a hatchback) and doesn’t need a trailer. Of course this also saves on storage space and means you don’t need a garage or driveway to leave everything when you’re not using it, although you do really need somewhere secure to leave it of course. Second, you can launch from pretty much anywhere you can reach the sea and don’t depend on a slipway or trailer access. In turn this may mean you can get closer to your chosen marks before dropping the SIB in the water. Second biggie is affordability. You don’t need a large, expensive, engine or the costs of maintaining a trailer in roadworthy condition. You don’t need a hefty towcar, with equally large fuel bills. Once on the water a small engine is nippy but very frugal – with a lightly loaded boat I’ve never been able to measure the fuel used by my 4 stroke 5hp Tohatsu as it is miniscule. A decent inflatable can’t be described as cheap, but it’s a lot less than the alternatives. A third pro is quite simply the fun of being in really close contact with the water, coupled with the ability to sneak in anywhere – explore caves, little beaches, etc. that a hard boat might struggle with. It’s not fishing, and it’s not that easy to explain until you’ve experienced it yourself, but it certainly adds to the enjoyment of being afloat. – no keel means it drifts fast in the slightest breeze. You can combat this to some extent by using a decent drogue and this can be pretty effective, but you have to accept that fishing in a windy day will be difficult even at anchor (as you will still veer from side to side more rapidly than a conventional boat). – a SIB is a wet boat. In a small inflatable you will probably park your backside on the flotation tubes, or maybe 8 inches above the water. Even in a calm day you will get wet – with any breeze or chop you might get very wet. Waterproof trousers are a sensible investment and I have thought about a drysuit as used by kayakers. – internal space is very limited. My 10′ 6″ Avon SIB is fine for one but quite cramped for two anglers. It’s OK if you’re organised, but you do need to limit your gear. – it gets cold, especially in winter. No great surprise there, but the lack of shelter coupled with an inability to move around easily does mean you need to have proper clothing – perhaps similar to the kayaker’s drysuit if you’re planning an out-of-season trip. There is a lot of misinformation put about concerning the safety of fishing from an inflatable. First off, the concept is relative – I don’t consider the Avon to be as safe to fish from as my Warrior, for example, but I do think it is safer than the majority of 10-12 foot long hardboats. 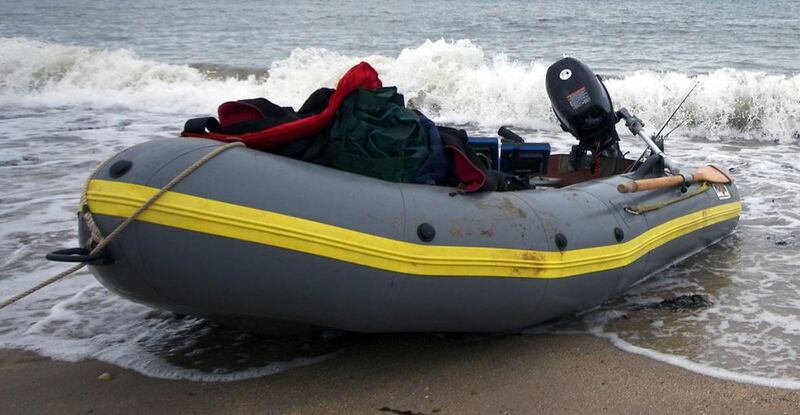 An inflatable is a very stable boat for its size, and I’ve never felt at any risk of capsize. – you’ll struggle to put a hole in it with a hook (I’m assuming you’re not daft enough to carry a gaff in one). – a large spurdog, or decent tope, could conceivably put a hole in the tube if they weren’t controlled quickly. However a tube is maintained by volume rather than pressure, so a leak is unlikely to be too dramatic anyway, and a SIB will happily float even with a tube deflated. Putting a wet towel over a fish will often calm it down and reduce any thrashing about. – falling overboard. A SIB can be bouncy, and a hand tiller can be more awkward than wheel steering and it’s not too difficult to envisage being thrown into the water if travelling too quickly in choppy conditions. I always wear a lifejacket and use the kill switch on a SIB, not something I automatically do on a hardboat. – flipping the SIB. A lightly loaded SIB will bomb along very quickly with quite low power outboards, and doing 20 knots is easily possible on my boat (albeit not with a 5hp engine, which maxes out at 12 knots). However 20 knots is a stupid speed to run at except in very calm conditions and might allow it to flip over in moderate seas. Using a longshaft engine will exaggerate this effect, although it’s not likely to matter until you’re over the 5-6hp mark. – it’s not practical to carry auxiliary propulsion. 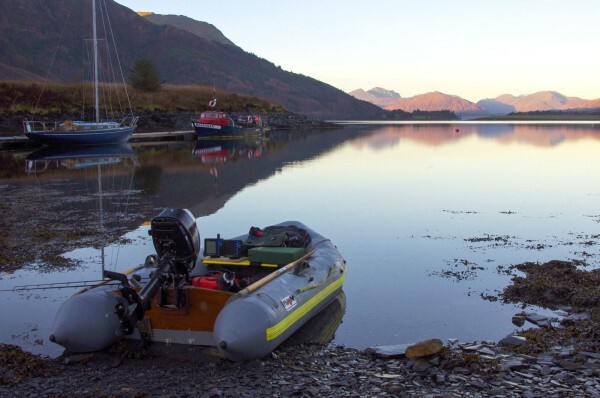 The small oars or paddles supplied with an inflatable will make no progress whatsoever against a mild tide or breeze, so you’re stuck if the engine breaks down. – Use your lifejacket and a kill switch. Always. – Carry a small anchor with some chain and enough light rope to easily hold bottom in the areas you fish. If your engine breaks down you must be able to stop the SIB drifting, and paddles/oars don’t count as auxiliary propulsion unless you’re in a very lucky position. – Carry flares, VHF and PLB (or at least some of the above). You’re small and won’t be spotted easily on a big, grey, sea. I personally no longer carry flares because they are of limited value compared to a PLB, are very difficult to dispose of, and aren’t practical for other outdoor activities like shore fishing or hiking. Not really very different from other boat fishing to be honest. I’ve a couple of rod holders fixed to the transom, and make sure I carry only a moderate amount of gear. I tend to take a spinning rod and a 12-20lb class boat rod and find that covers most situations. Slicing and dicing bait is obviously something to undertake with a little care – basically by making sure the knife is sheathed as soon as you’ve finished with it. I only ever cut bait on the wooden floor of the Avon, but a reasonable sized chopping board would make an OK substitute. Comfort can be an issue both because the boat is cramped and also because you tend to sit very low down on the tube or on the seats (less of a problem with larger inflatables which have bigger tube diameters). 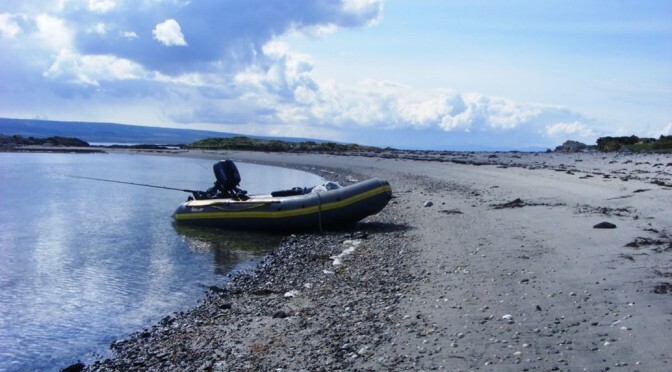 I try and take a break ashore during the day to avoid this problem, and also use a trout fishing seat cushion to raise the seat a couple of inches and sit a bit more comfortably. I’ve used both a sit-in and a sit-on kayak, but to nothing like the same extent as I’ve used a SIB. 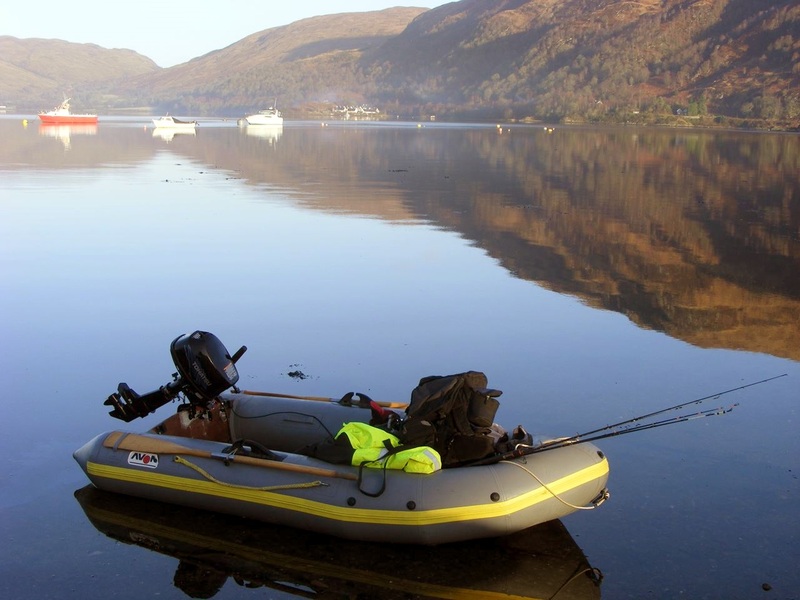 The popularity of kayaks has certainly exploded in recent years and personally I’d like to have both, but I do think the SIB has the edge for practical sea angling, particularly if you fish alone. My biggest concern is that Kayaks do have a greater tendency to dump you in the sea which is potentially a big problem unless you are competent enough to recover the situation. In addition SIBs are faster, can carry more gear and cover more ground and are more comfortable to fish from – although you are completely dependent on your outboard. Paddling is quieter and a very satisfying way to explore a coastline and I wouldn’t knock it, but a SIB is a better choice for my needs at the moment. 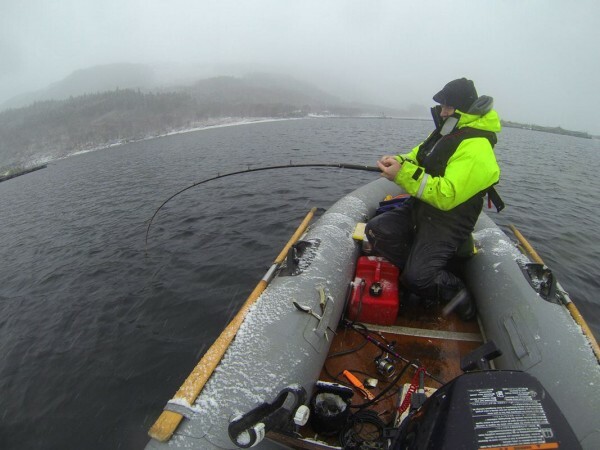 A lot of anglers who think about a SIB struggle with the size and engine to choose. Too big and you lose the portability that is so important, whilst too small rapidly becomes limiting or dangerous when out fishing. For single handed fishing I wouldn’t drop below 2.8m or go much above 3.4m. A bigger SIB will generally have larger tubes and will probably be drier, but the weight starts to increase quite quickly, and getting it in and out of a car boot will become trickier. For two anglers then 3.4m upwards is probably a better choice, provided you can handle a much heavier outboard that will likely be needed. A modern 4-stroke engine weighs a ton relative to its older 2-stroke ancestors so I wouldn’t go above a 6hp for single handed use. Even an 8hp engine can weigh 40kg and I don’t fancy carrying that any distance over slippy or sandy ground. 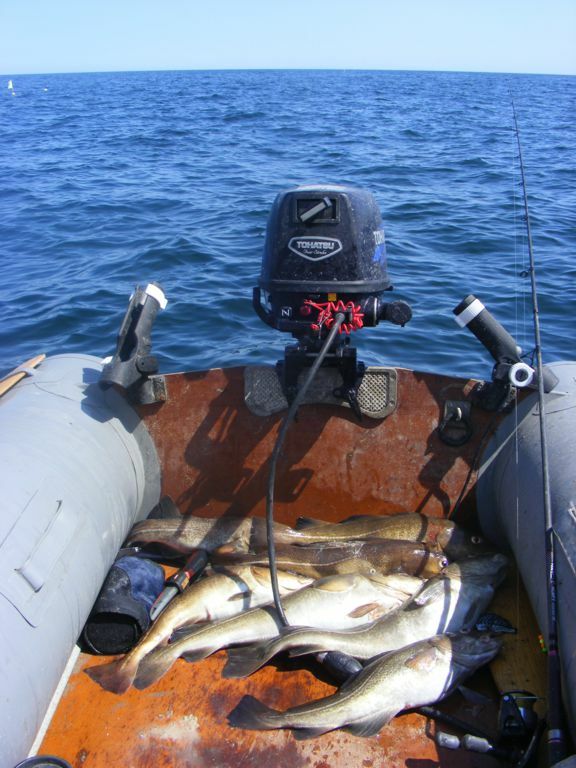 At the other extreme, a small 2.3hp outboard is easy to manage and will cope fine in sheltered water – but it will be slow. Many people keep their SIBs on a trailer, but to me this means losing the pack up and go aspect that is one of the most attractive aspects of SIBing to me. Once you get to this sort of set up you’re comparing against RIBs and other hard boats, so the choices get a bit harder. You can view all my posts on SIB fishing here. I can’t really advise on the safety of an inflatable kayak on the east coast I’m afraid, as I have no relevant experience of kayak fishing. I know that fishing from a SIB gets more difficult above maybe 5-7 mph wind, simply because of the skitter effect you get in a light inflatable craft – that’s why I tend to use a drogue in anything other than a very light wind. The other factor to consider are tides, which will typically reach 1-1.5 mph at peak flow, and usually flow along the coasts – so you really need to plan trips to take these into account. 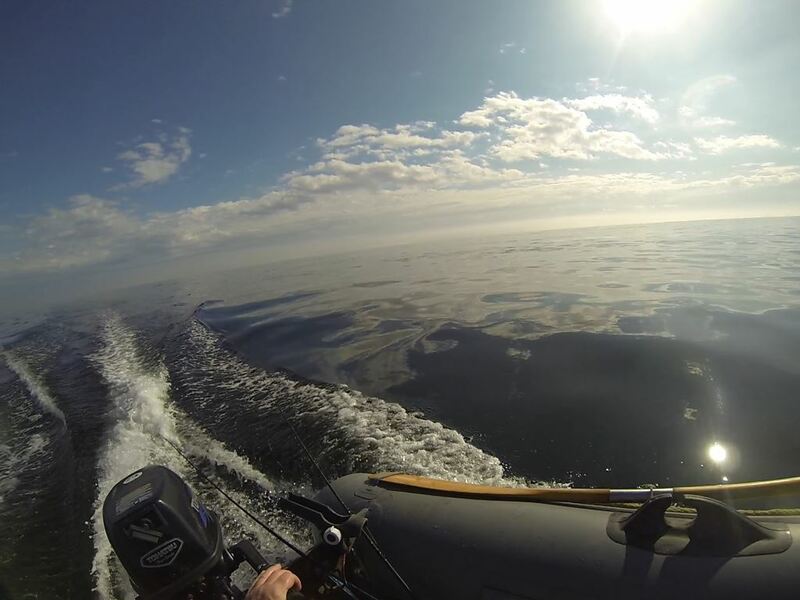 If you have wind pushing against the tide conditions will get difficult for a small boat/kayak quite quickly, so you really need to be aware of them. In terms of access to good fishing very close in, my money is on Cove Bay south of Aberdeen or possibly Skateraw or Pease Bay near Dunbar. Cove Bay gives access to marks both north and south of the harbour and you can launch 30 yards from the car. Ideally you’d want to be able to paddle 2-3 km along the coast, but there are plenty spots to fish closer than that. Almost all the best fishing along this coast is very close in – often a few feet from the cliffs and rarely more than 100 yards out, in water that’s 30-50 feet deep. Ideally you need no wind, or a light W/NW wind here that gives you shelter close in – a summer breeze often picks up from the south in the early afternoon, so I’d aim for an early start. Sometimes you’ll get a swell running even when there is no wind, so check out the surf forecasts on the like of Magic Seaweed – basically don’t expect to get out of Cove very often and don’t try unless conditions are very good. Mainly codling, mackerel, dabs with a sprinkling of Pollack, wrasse, etc. I usually just drift along the coast with the tide with either a jelly worm on a leadhead, or a simple baited rig. A decent spinning rig or 12lb class outfit will do nicely. If Cove doesn’t appeal then Catterline, south of Stonehaven might be an alternative, but not one which I’ve personal experience of. Skateraw (near Torness power station) is often used by kayakers, although most fish half a mile out or more. You can get reasonable fishing close in to the breakwater at Torness but I find it is better further out – Launching at Skateraw is pretty easy, but it is exposed to most winds and suffers from afternoon sea breezes in particular. Whitesands beach about 1-2 miles west should be OK for launching and there is good fishing a few hundred metres out from Barns Ness lighthouse (Pollack, codling, wrasse and mackerel mainly). Pease Bay would give access to marks close in to Sicar Point about 1 mile to the east where I’ve had some good fish very close inshore, although it is a bit hit or miss I find. Not sure about access to the beach at Pease Bay, as it’s part of a caravan site, but surfers use it sometimes so I guess it’s possible to get down there. You can get fish by anchoring, but most fishing is done on the drift over rough ground, with most fish apart from mackerel being taken on the bottom or close to it, so you will lose gear. I’ve had a couple of double figure fish very close in, but most will be in the 1-5lb range, although Pollack can get a good bit larger than this. Mackerel will do for bait, but I find rag/lug or mussel can score heavily close inshore. Have you thought about the west coast sea lochs – the weather and tides tend to be less challenging (but still there! ), and it’s not all fishing in 300 feet of water for rays and spurdog. There are plenty of Pollack and codling in lochs like Carron and Leven that you can pick up close in on bait or lures in less than 100 feet – fishing for them is better on the east coast, which is one reason I don’t usually bother myself, but they are there. I just stumbled across your blog via an image search. It’s really nice to read some stories from another SIB enthusiast! I have a similar sort of boat in Northern Norway and wrote a blog about my trips for a while too. I’ve gotten a bit lazy when it comes to updating it these days though! What a great site. I have thoroughly enjoyed browsing. I have recently acquired a good quality inflatable kayak and may well take the plunge (hopefully not literally) and spend some time fishing in Leven or Etive. I have already had some great fly fishing sessions on Loch Doon where the kayak is excellent for sneaking up on rising brown trout. I will also be setting sail shortly at Luce Bay in search of bass and will post some pics if I get lucky.